How’s that for a title! One of my sweet sweet friends is adopting a beautiful baby from Uganda! We are SO thrilled and excited for this amazing family!!! In just over a month, he will be in their arms forever! This baby boy is going to be SO blessed to grow up with a mama and a dada who love each other so much, who are such amazing examples of Christ, who are already crazy good parents and who have so much love to give to this precious one! Congrats Ian and Mindy! 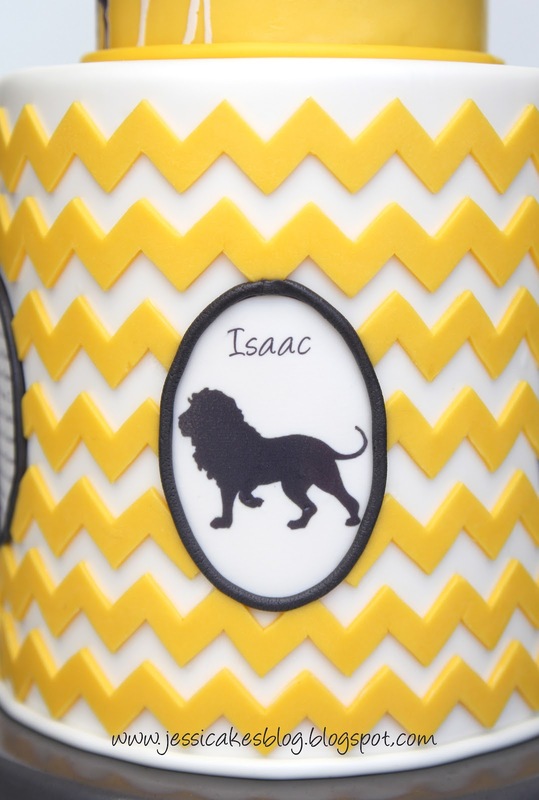 We can’t wait to meet sweet Isaac! Today we had a baby shower for Mindy! We all got together to shower her with love, prayers and support for their newest addition. 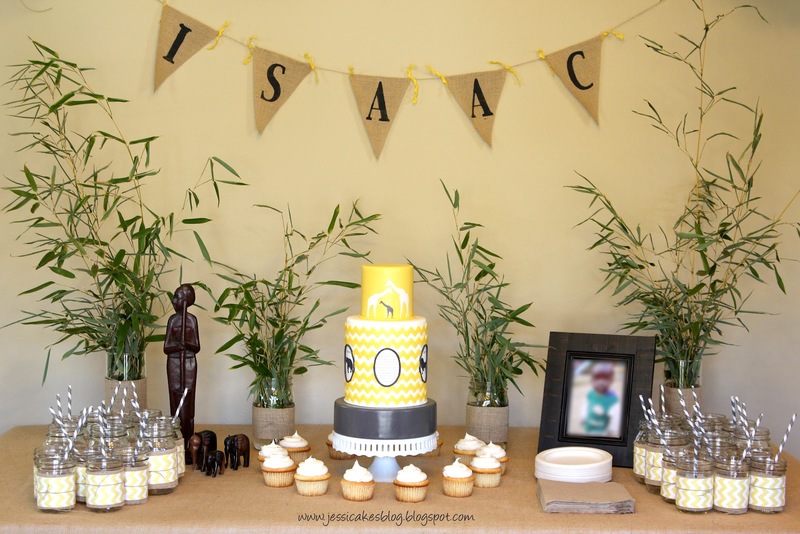 Three of her close friends (all named Sarah by the way – well, one is named Sara…no “h”) put together a fun theme for the shower…It was going to be a Safari theme complete with burlap and bamboo…with a chevron pattern in place of a zebra-type print! – because Mindy loves chevron. The colors were yellow, gray, burlap-brown, and a little green from the bamboo. 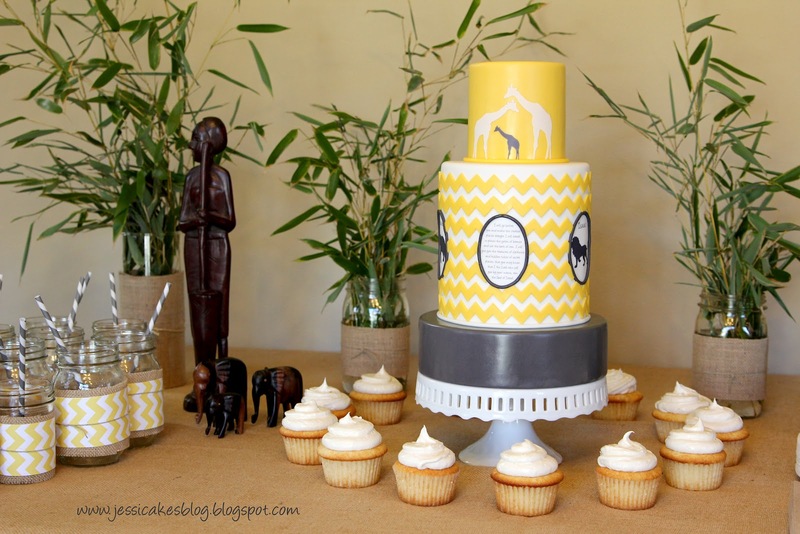 Hmmm, I thought…burlap, bamboo, safari animals and chevron…on a cake!? It actually stumped me for quite a while on how I was going to pull all that off! Here was the final sketch I came up with after 5 or so other versions ended up in the garbage! I was really inspired by this gals nursery art on etsy. I really wanted to personalize the cake! I wanted to include a verse that had meant so much to Mindy over these past 4 months. God has walked with them every step of the way and has given them such wisdom throughout this process. Adoption is such an amazing example of Christ’s love for us! He has adopted me! – by His Son’s blood! This little guy, that Ian and Mindy are adopting, has done nothing but be born into a dire circumstance that seems hopeless to so many people. He doesn’t have money to give or a fancy resume. He hasn’t won some lottery or has done anything note-worthy…he’s just been born into a yucky situation and has no way of getting out of it on his own. Just like us. We were born into sin…a dire situation! We are unable to wash away our own sin and would never have a chance to enter Heaven without a Savior! – someone to redeem us…to reach down and pull us out of our yucky situation. Ian and Mindy have prepared tons of paperwork, paid lots of money, made travel plans, and will soon be picking up this baby out of his crazy world and will be bringing him to a place of promise…a place of hope! Just as Jesus has done for us. By His life of preparation, by His work on the cross, by the debt that we owed but that HE paid, we are saved! He has adopted us…those who believe on His name will be saved! – it’s a promise. And, someday we will be brought out of this crazy world and given a Heavenly Home where no more tears will be shed…where we will live with our Lord forever. Not because of what we have done, but because of what HE has done for us! Praise be to God…our loving and merciful Savior for His sacrifice…for doing all the work to save us! Now I get to live a life of gratitude by glorifying Him and worshiping Him for His amazing love! 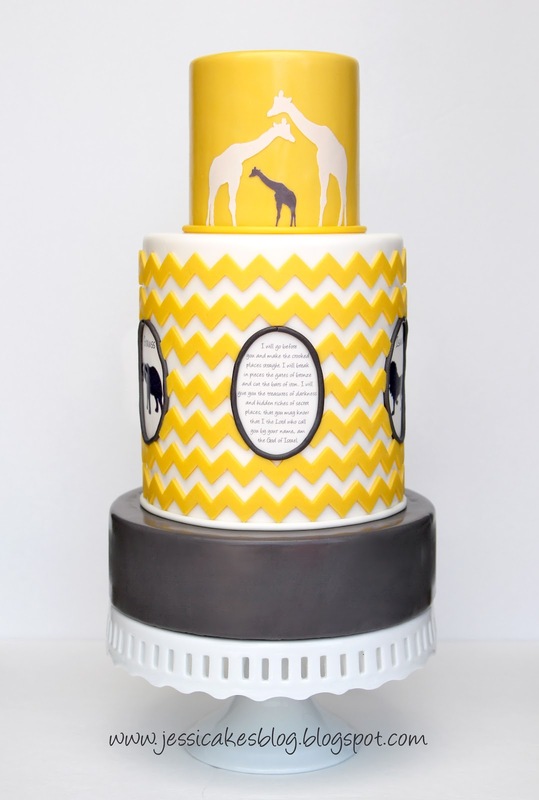 I ended up printing the verse and the animal silhouettes on icing sheets so they would be clean and graphic and I could just apply them right onto the cake…saving me some time! Besides the verse there were four animal silhouettes around the cake. A lion, a rhinoceros, a giraffe and an elephant. Each animal had one of his names over the top…he has lots of names! :) That’s the beauty of adoption…they’re keeping his African name and middle name, then giving him an American first and middle name. He’s going to have a great story! The Sara(h)’s and Deb did such a great job designing everything. You should have seen all the cool pompoms and burlap flags that were everywhere!! Sorry I didn’t take pics of everything! Here’s one of the food tables…the one with the cake…very important! The top tier was a 4″x4″ chocolate cake with vanilla buttercream crumb coated in dark chocolate ganache. The middle tier was a 6″x7″ cake with six layers of carrot cake and white chocolate coconut cream cheese buttercream (melt down a Lindt white chocolate coconut bar and add it to the vanilla buttercream recipe with cream cheese) crumb coated in white chocolate ganache. The bottom 8″x2″ tier was my chocolate mudcake made gluten-free! :) I just used my mudcake recipe and sub’d gluten-free flour and added an extra egg…it was amazing!!!!! Tasted like a brownie…not at all gluten-free! Now, onto the how-tos…The Chevron Pattern! Here’s the template I created in Autocad. This fits a 6″round x 6.5-7″tall cake. Since I made this template, I found this FMM straight frills cutter set 2 that has almost the exact same zig zag I used in my template. Click HERE. It could save ya time instead of printing mine out, cutting out the template then hand cutting out all the zig zags! I have a special technique I came up with to attach horizontal patterns onto a cake. I have a Craftsy class where I show you step by step how to do it in high-def video! – so if you want to watch that, take THIS link to Craftsy and check it out!! I LOVE this technique and use it ALL the time. I’ve shared it with you before on the FashionCake I did…but I’ll share it again in case you missed it. I use wax paper to hold my design while I transfer it onto the cake. This way, the fondant/modeling chocolate doesn’t stretch, bend or tear. It works beautifully! 1. Print out your design and tape it to your counter. 2. 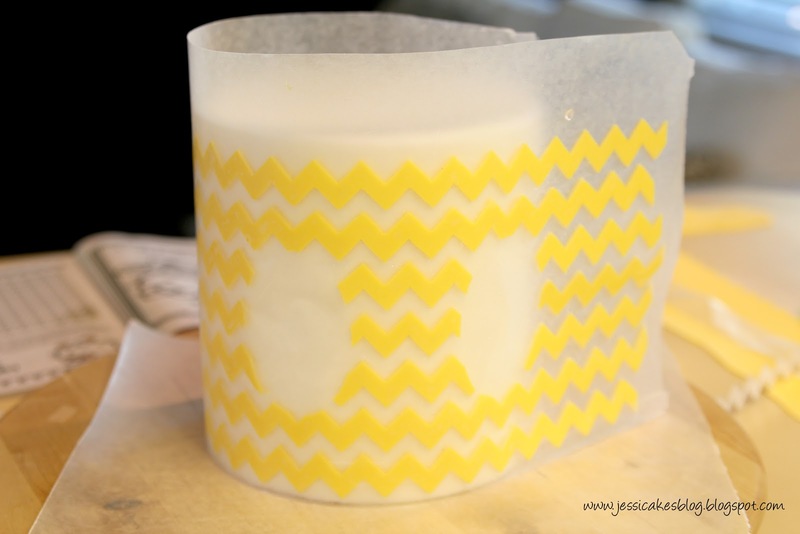 Cut a piece of wax paper that is the same size or slightly larger than your pattern. Line the bottom straight edge of the wax paper up with the bottom of your cake pattern. This ensures when you apply the pattern onto your cake, it goes on level! 3. Grease up the wax paper with Crisco! This is what helps the fondant “stick” to the wax paper while you move it up onto your cake. 4. Cut out your design from fondant/modeling chocolate using a template (see at the top of the picture above). It took me over an hour to cut out 7 lines of chevron! LOTS of little cuts! 5. Carefully transfer the cut fondant to the wax paper and line it up to make sure it’s straight. If you want to, you can also use your template or cutters to cut right on the wax paper. Just be careful not to cut super hard or you’ll cut through your wax paper. 6. Once you’ve applied all the fondant to the wax paper and matched up the pattern, it’s time to flip it over onto your cake. At this point you’ll un-tape it from your counter, turn it around so the bottom lines up with the bottom of your cake. You’ll want to wet the fondant that’s facing up so that it will stick to your cake. So, go over the design with a little brush of water. Then, lift it up and place it close to your cake so the bottom straight edge sits at the bottom of the cake and begin wrapping it around the cake…see pic below. See how the bottom straight edge of the wax paper is right on the board…lined up with the bottom of my cake. 7. Go around the cake on the outside of the wax paper and gently press the pattern onto your cake to make sure it’s stuck well. Then, peel off the wax paper (like in the pic above). And, VOILA’…instant, straight horizontal pattern…no stretching, tearing, etc! 8. All you have to do now is line up your seams where they meet in the back and rub/wipe off some of the excess Crisco left from the wax paper. How easy is that!! :) Try it…you’ll never do horizontal patterns any other way! I definitely would have done the silhouettes differently, but once I cut the chevron and attached the silhouettes, I couldn’t go back. I didn’t like how thick the border was around them. But, I had to make it that thick to hide the edges of the chevron pattern. Next time I would have mounted the silhouettes on fondant and put a a small band of gray around the edge, then applied that on top of the chevron pattern so it stood off the cake a bit, instead of the silhouettes being recessed into the cake…live and learn! :( But, seriously….who cares right?! I hope you have a wonderful week ahead!! Thanks for stopping by! I really found this unique for baby shower goodies! That is such a brilliant idea! Thanks for sharing! And i love the entire design as well! Thanks for sharing your ‘horizontal pattern transfer technique’. Seems brilliant! Absolutely lovely! I am sure nobody but you thought the lines to thick around the animal silhouettes! And thank you very much for repeating the how-to for the horizontal patterns! Can’t wait to try it out! the cake is stunning! I love the chevron pattern. Thank you for sharing the technique used to transfer patterns – it will come in handy I am sure in the near future. All of your cakes are amazing! My heart soared when I saw this cake. You have made me many special cakes through the years, but this one brought tears to my eyes. Seriously Jess, you are the best friend a girl could have – I know this took so much time and thought… but you nailed it. Couldn’t have been more perfect, recessed and all!! I’m super blessed to have you in my life! Jessica- I really love your blog!! Very inspirational. Thank you for sharing such great knowledge! Preach! Love you and how you use all of the wisdom and creativity God has given you!! great cake creation as always, very neat. And thank you for sharing. Will it works for vertical lines as well? Many thanks. Lena: It would work for anything. I hardly ever use it for vertical strips as I usually use modeling chocolate and they’re never longer than 6-8″, so I don’t have issues with it stretching. But, if using fondant, then it would help! You are so unbelievably talented and sweet! I’d love to know which autocad program you use, if you don’t mind. jmlpitbull: I have AutoCad LT 2012. Thank you for your sweet words! I’m so glad I found this blog, thank you for sharing! Even though I enjoy everything cake decorating, I was especially moved by the Passage you shared and the thoughts behind it. I hadn’t looked at adoption that way, thanks for opening my eyes. The cake also looks amazing! Simply awesome Jess! You never cease to amaze me with the creativity in all your cakes. What did you use for the animals? La Familia Crespo: You are sweet! Thank you! All the animals were printed on icing sheets and cut out and applied onto the cake. Oh my goodness this is beautiful! Your blog is my favorite for sure. Your tutorials are so precise and helpful and every cake you make is fantastic. Well done!!!! The chevron is excellent. This is so beautiful. Thanks for the very cool technique how-to. But most of all, thank you for your God-given words of love, support and encouragement. This was a beautiful, beautiful post, and I’m not just talking about the cake. Thanks everyone for your sweet words, your support and encouragment! I hope that this blog continues to encourage your heart as well as your passion for cakes! – that it may bless tons of people! Thank you so much – I’ve always dreaded horizontal designs – I will try this! Jesus is all we need if we want to have success in every part in our lives! I really love this cake, well done. I have a question how would u actually cut the middle layer? majorie d: The middle tier is like two cakes stacked together before I covered it in fondant. So, you’d slice it just like a regular cake…only, it would only slice down halfway because there is a board in the middle…making it only a 3″ high tier. Love your beautiful work! You are truly amazing! I love you’re beautiful cakes!!! How did you make the perfect animal silhouettes? Are they a free hand cut? Karen: It depends on the cake, but this one I rolled the fondant to about 3/16″ or so thick, then laid it over the cake and smoothed it down like smoothing the pleats of a skirt. Pulling out a bit at the bottom to keep it from folding. I hope that helps! It’s hard…lots of practice…and it’s still not perfect! Melodie: The animal silhouettes are edible images. Thanks for your sweet words! Jessica, you are such an inspiration not only do you do Awesome cakes but you are an amazing women who loves God above anything, i can see that by reading your post. I am so glad that i “stumbled” across your blog; you have taught me so much! (I’ve been decorating for over 7 years) you encourage me with your sweet words and by the love that you have for God and others the time you take to share all of these tips and tricks show how you love others Thanks. Amazing!! Anonymous: You are SOOO sweet to send me such words of encouragement! May the Lord bless you back and fill your heart with joy! Hi Jessica, I am just in love with your blog and am catching up on reading your cake adventures through the last couple of years. I read that you use jumbo straws on your cakes – did you use it on this Chevron cake? I have used it on two tier cakes but have a three tier cake coming up and wonder if the jumbo straws will hold up. Thanks and keep doing your amazing work! I only use jumbo straws…they’re sooo great because they don’t displace the cake, they’re super easy to cut and very strong. So, go for it! Depending upon how you’re transporting it and how tall it ends up being, you might want to consider using a center dowel/support for anything 3 tiers or over. I didn’t for this cake because it was smaller and the bottom tier wasn’t full height…but anything taller and I would have. My goodness! What a simple and fantastic way to apply horizontal patterns! Thanks for the tip! Great, as always. Thanks for sharing. Thank you for that wonderful tip on the horizontal stripes. It is going to make life so much easier! Can I ask if you can put up a tute on the edible images you did. I’ve tried googling icing sheets but am still stumped how you did those. Do you need special equipment? Jessica, this is a truly beautiful cake. Thank you for sharing your technique! I have a question if I may – would you recommend using modeling chocolate for something like this? I have chevrons to apply to a 7″ standard height tier. I’ve used modeling chocolate in past, but only sparingly. I love how easily it cuts. And when you say, ‘carefully transfer the cut fondant to the wax paper’ this is probably a lot harder than it sounds! How do you actually do it? Do you slide it into position, or try to lift it on something? I can picture doing everything else, except this! Thank you so much! I used modeling chocolate for this design…sorry if I said fondant! I would try and only use modeling chocolate because it doesn’t stretch as easily. I cut several out so that the first one would set up a little and make it easier to transfer. I cut them right by where the wax paper was then used a long ruler to lift it up and place it on the wax paper so there was very little holding/handling. It’s not very difficult at all! Much easier than trying to put it up on a cake! I hope that helps! Hi Jessica: Your blog is amazing!!! Thank you so much for sharing your secrets, talent, knowledge, and time with us! Quick question: The cake is displayed on cake stand. What are the steps to achieve that look from kitchen to event location? I noticed the bottom board is with the same diameter as the cake. How do you transport/pick up cake without compromising the integrity of fondant? Thanks so much! I transfer my cakes when the cakes are cold…right from the fridge before they start condensating. I’ll have everything ready to go…the tier under it doweled and the melted chocolate warm and ready. I spread the melted chocolate on the cake stand or the bottom tier, then take the cake right from the fridge, using my clean hands, and position it on top of the warm chocolate and make sure the cake is nice and straight. The cake/fondant is hard right from the fridge so it doesn’t leave marks. Sometimes I’ll use a bench scraper under the bottom with one hand, then hold the cake steady with the other. Now, if I’ve been decorating the cake for a while and it’s soft/warm, then I put the cake and the board it’s been sitting on (my turn table) right into the fridge together to firm up before transferring the cake to it’s final resting place. Depending upon the design, I might just use a bench scraper and transfer it to the fridge on it’s own, but usually I don’t touch it unless it’s nice and hard…and before it starts to sweat!! Erika: That’s the tricky part! Either I drive with someone and hold it on a cookie sheet with a non-slip pad, on my lap, or I put it on a cookie sheet with the non-slip pad under the stand and roll up towels all around it so it doesn’t shift…then put it in the front seat with me and hold the edge if I go around a corner…just to be sure! Fun times doing deliveries! Usually I have someone drive me! Lol, deliveries are super exciting! Thanks for clearing that up for me. I use ChefMaster color gels, the pinks have never faded. When I photograph my cakes, I feel the photos don’t do my cakes proper justice. Your photos are super professional. I’m interested to learn more about lighting, angles, etc…I really appreciate your time, knowledge, and generosity sharing your techniques! Your blog has allowed my skill level to improve to the next level! Thank you for that! Thanks so much!!! I’ve since upgraded my camera to the Canon T2i and got the 25-75mm macro lens for it. Also, since it’s been dry around here, the past four cakes or so have been taken outside against the house instead of inside. Just make sure you’re taking them in an indirect lighted area. Taking pics outside with no flash makes a HUGE difference!! What color is the bottom fondant? Or did you use molding chocolate? If so, is there a recipe on here I can see? Also, do you use a wooden board for the very bottom of this cake to support all the weight or would a styrofoam one work just as well? Thank you so much! You are a very gifted lady. It’s fondant…a dark gray color made by mixing black into the marshmallows before adding the powdered sugar. The bottom of each tier is a cardboard cake circle. Then, it all sat on a cake stand. What brand of food coloring/gel do you use? Americolor or Wilton…depends on where I am when I need to buy them! Yes, all the images are printed. If you don’t want to do that, then you can just paint them on with some black gel color mixed with vodka or lemon extract. I think the ovals were around 2″ tall. You can size them for whatever height you end up making the cake. Do you have a trick on how to camoflauge the hole from the center dowel if you ever end up supporting it that way? I normally end up putting something on top of the cake but if I was to do a clean look like this without any toppers, is there something I can do to hide the puncture hole? Thanks! Either you can just dowel the bottom two tiers (and not the top tier) or you can create some kind of design for that top tier…like a simple circle of fondant. There is no way to “hide” it if there is nothing up there, so I would either not put a dowel through the top, or design something to cover it. Another idea would be to dowel the bottom two tiers and leave about 3″ of the dowel sticking above the second tier. Then, put the third tier on the dowel and slide it down so its sitting on the second tier, but that 3″ is inside the top tier…holding it nice and solid to the rest of the cake. You’d just have to make sure you put a hole in the cake plate of that third tier so you can put it on the dowel. I hope that gives you a few options! Hi there! This cake is so darling! This would be a perfect cake to mimic for a baby shower I’m planning! What perfect timing to run into your blog Yay! Can you tell me what you used for the top tier as far as the giraffes? Did you use cookie cutters or traced them? Also, I read through your blog and you mentioned the middle tier was 6 layers, would you be able to tell me how many layers the top and bottom tier are? Thank you! You have found a new follow, I am in love with your work! I found a giraffe graphic online and printed them on edible paper. I had some left over from doing the animal silhouettes. I cut them out with an exacto knife and put them on the top tier. The bottom tier was 2″ tall and the top was 4″ tall. I hope that helps! Thanks for your sweet words! Blessings! Jessica, your are the greatest,and your cakes are awesome, awesome, awesome!!!! I’ve learned so many great tips and lessons from your tutorials. I’m thankful that you were blessed with a sharing heart. Absolutely stunning! I have wanted to try chevrons for some time but was intimidated. Thanks for sharing your technique – will most certainly give it a try!! So I tried the chevrons using the video instructions from MyCakeSchool – which I recently learned is based on your method/technique. I wasn’t completely happy with my first try – my edges were a little rough and the pattern didn’t line up as nicely as I’d like, so I will definitely try again! Thank you! I saw her video too and realized she was cutting her chevron out right on the wax paper. The only challenge is if you cut too hard, you’ll compromise the integrity of the wax paper when you pick it up to put on your cake. Try cutting the pattern out separately, then use a strip of wax paper coated with crisco to transfer that cut out strip to the final wax paper you’re going to use to put up on your cake. This way you can get a clean cut and not compromise the wax paper. I’m actually going to do a video showing this technique with a few designs in the next week or so. So, stay tuned! Thanks for the tips!! Great – looking forward to it! Would be great to see more videos from you. Your cakes are impeccable! Take care. Jessica, is there something else I can use in place of the crisco? I never carry it and am going to do a german chocolate cake, ganaching it and using modeling chocolate for the design (to preserve the flavor of the cake). Thank you!! I guess you could use butter! If you have a colored fondant/modeling chocolate, it might show the yellowy color of the butter a bit, but you need something greasy that will hold the design but also allow it to peel off. After the design has set up a bit on the cake, just use a tissue or brush to get the butter off. Wow!!! Amazing!!! Quick question, do you have to know how to use the software well to operate it or is it easy to use? I use Autocad in my profession. I’m a commercial interior designer “by day”! It’s a complex and expensive program…not one I’d buy just to design cakes with. This is a fantastic tutorial! Thank you very much Jessica for showing us how to make the Chevron stripes. Wow.. It’s nice to know to have a sister in Christ out there with the same passion.. Hey Jessica really nice technique! I just wonder how did you cut the zigzags? Much love from the Philippines! Praise the Lord for sisters in the Philippines! I cut them out with a sharp, pointed exacto knife I got at a craft store. I used the zig zag template you can see in one of the pics above. Basically, I cut up one of the templates so I could have a zig zag template to use. amazing! Thanks for the tips! will use these next time I make a cake! Jessica, I am so amazed and blessed today, because I found your tutorial on youtube and therefore found your blog. You have been such a blessing to me today. I am a child of God who has kind of strayed from my faith and God has been calling me back in a big way. In reading your bible verse above from Isaiah, I found tears streaming down my face and God spoke to me in a mighty way. Thank you for the beauty you have brought through your tutorials and blog that has helped me with my passion for cakes, but also thank you for the words you have brought me from God that helped to remind me of the passion that God has for me. I needed to hear those words, have been praying for words from God and I found them through you. Delanosgirl! I wish I could reach through your computer screen and give you a huge hug! God desires all of you…He loves you too much to let you wander too long. He adores you, He created you to be in fellowship with Him and you will find no other place more joyful and full of peace than in His arms following His plans for your life. Don’t fight Him…embrace Him for He waits for you…to bless you, to fill you, to give you hope. He is worthy of your trust! I will be praying for you tonight! God bless you richly! What is the point of removing the written portion of the chevron stripes ‘how to’ if you have not posted the video tutorial? If it was to accomplish annoying someone, you have succeeded. I ‘pinned’ your instructions over two months ago so I would know exactly where to refer back to when I had to decorate a cake tonight and they are gone. Definitely will not ‘stay tuned’ to your blog. I’m so sorry you’re upset! That obviously is not my heart or intention. This entire blog has been set up to help others. If you have questions, please email me and I’ll be happy to try and help you out!! Hi jess, thank you so much for your kind heart. I’m so glad o find your blog recently, although some tutorials are missing.but surely i’ll be waiting paiently for your videos by the way, do you have any youtube tutorials? Can’t find any by the nae jessicakes. What name should i search? Thanks and bless you…! Thanks for your patience! I will have a wonderful video ready to be seen middle to the end of February. I took down the videos on youtube because they’re being re-done. Hi Jessica, thank you for taking the time to create these tutorials. I look forward to your videos! Your cakes are beautiful, btw! 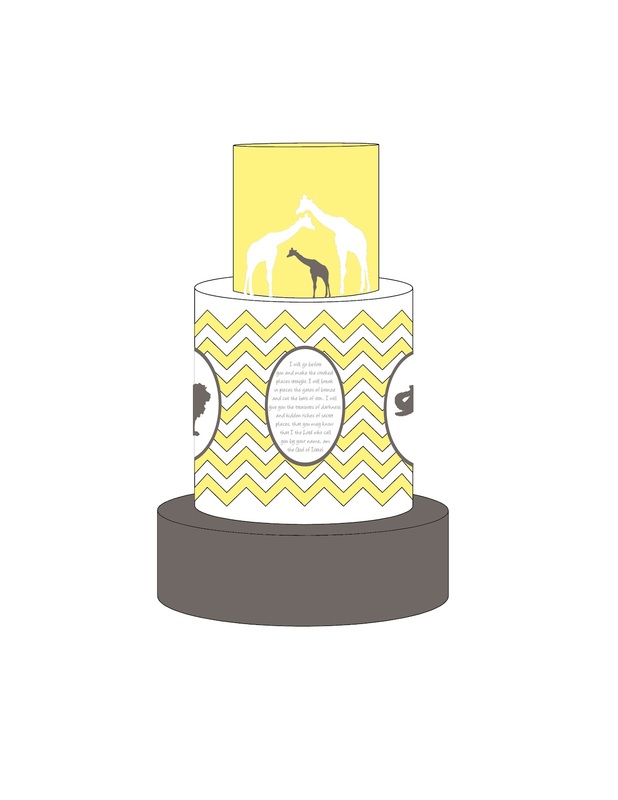 I am particularly fond of this chevron, safari cake. It is incredibly unique; I have never seen anything like it. I am curious about the double barrel technique. Is it possible to do a double barrel with buttercream? That is, without covering it in fondant? I would like to give it a try for my son’s first birthday cake, but I’ve never covered a cake in fondant. Honestly I’m a little nervous about trying two new techniques at once! Also, will your pattern transfer technique work on a buttercream iced cake? Lots of questions, I know! I do appreciate any help you can give me. Thanks! Yes, it’s easy to do a double barrel with buttercream…you just need an extra long straight edge/bench scraper to smooth the edges to the top. I haven’t done the transfer technique with buttercream. But, if you’re using a butter based buttercream and put the cake in the fridge, it’ll be nice and hard. Then, when you get your pattern ready to transfer, just pull out your cold cake and wrap it around it. You might have to adjust a few things here and there, but it should stick and you shouldn’t damage the cake too much because it’ll be really firm. Thanks for your help, Jessica! I’m definitely going to give it a go! Yeah! Let me know how it goes! I’m not really “back”…just sorta! hehe…yes…I have the same struggle!! The biggest trick to it is to keep the fondant/gumpaste/modeling chocolate really thin so it doesn’t weigh a lot or fight gravity and fall off. You also need to leave a little extra room on your wax paper (at the top or the sides) so you have a place to hold it. The bigger the cake, the harder it is. So, an extra pair of hands on large jobs is always nice! If I do this with modeling chocolate do I still use crisco to grease the wax paper first? Probably a stupid question but I want to make sure. Not a stupid question! Yes, the crisco helps it stick to the wax paper! I feel so blessed to have found your blog…your personality and talent are so inspiring! From far, I can tell that you are such a wonderful person…inside out n that shows on your beautiful face! Keep it up! I am still new in cake decorating. Hope to be as good as you one day! God bless you! Thanks for taking a moment to encourage my heart! Blessings to you in your cake decorating journey! Thank you so so so much for this wonderful blog! It is so very helpful to a lot of us! I noticed some mean comments earlier….please ignore them as they don’t know how to be appreciative…you are doing them a favor, not a service that you should be accountable for, specially when they are so rude. Thanks Lisa! I don’t worry about those comments…I know that this world is fallen and there a lot of sad people out there…so, I just smile and pray for them! Yes, save it to your computer than scale it to the size you need. If it doesn’t work, then email me (address is above on the side bar) and I’ll forward it to you. If that still doesn’t work, you can always find a random chevron graphic (search google for “Chevron Graphic”) then cut it out on card stock to make your own template. I got it at TJ Maxx…a few years ago! Thank you for your help with applying the chevron pattern to the sides of my buttercream cake. It worked out perfectly. I just got my cake nice and cold and lightly pressed the pattern onto the sides of the cake. No problems. The only thing I did differently was I used freezer paper as opposed to wax paper. It worked out great! Yeah! Freezer paper would work great too because it’s got that nice non-stick side! What a gift you have! Thank you for sharing your techniques. You are a HUGE blessing to all that love to dabble in the world of cakes. Hi Jessica. Was wondering what type of printer and icing sheets you use? I have my images printed at a local cake shop. I have a canon pixma printer ready to go but haven’t gotten the edible ink for it yet! I can’t wait to try it from home!! Wow wow wow, I just stumbled on your blog via PInterest, and boy am I glad!! You are soooo talented and so generous with your knowledge! I’m so grateful for that, I’ve been on here about 15 minutes and already learnt so much! The trick of crisco-ing your paper to get the fondant chevrons to stick is really clever. And AutoCad! I have never heard of it but it sounds good and it so makes sense. I too am a perfectionist and am striving for cakes as flawless as yours! Thanks so much. This is such a beautiful cake, but I think the story behind it is more beautiful. My sister is adopting from Uganda as we speak. I am in awe of God’s goodness and grace. How much He loves this sinful world and how desperately He wants all to enter His Kingdom. Oh, praise the Lord for His goodness!! There are SO many sweet babies that need a loving home! Praise the Lord that He is sending rescuers to that area to bring these little ones home to a family that will hopefully teach them about how much Jesus loves them!!! I love that you are using the gifts God has given you to turn them into blessings! We find SUCH joy in that!! I hope you enjoy the class and use those tips, tricks and techniques to further bless those around you! To God be the glory! How would I transport this cake? Would I assemble after I get to where I am going? Or, could it travel assembled?? I sat in the passenger’s seat and held it on my lap!! But, normally you’d probably set it up after you got to the venue…that would be the safest! ok. I am an architectural designer by day and I’ve used autocad to design some stuff but this wax transer idea is new to me! Where have I been?! Thank you! Just a small shout out to you on my blog (http://shazascakespot.blogspot.com). I used your transfer method for the chevron pattern and it worked like magic. I have all you craftsy classes, they are fantastic. Thanks again. Thank you so much!! So glad it worked so well for you! Blessings! I have followed your blog for years now and I finally have the courage and the cake for the chevron design. Unfortunately she (my niece) does not like fondant of any kind and has requested the the cake be covered in buttercream with only fondant decorations on it so she can easily peel them off of her slice. She is graduating from high school and I want to make her the cake of her dreams. Do you think this would work putting it onto a buttercream covered cake instead of one covered in fondant? Hi there! Sorry for responding so late…but yes, you can use this design on buttercream. Just use a butter based buttercream that will set up in the fridge and get hard so when you wrap the design/press it slightly the buttercream won’t squish out everywhere! Blessings! Hi, I don’t know if you can help but you said that you used Crisco. Unfortunately this isn’t in Australia and I was wondering what is it like and maybe what I can substitute for it. Hi there!! I think they call it Solite. It’s a solid vegetable shortening. You can also use butter! Thank you! Especially for such a quick reply. Would butter leave a bad taste on the fondant? Also if you laid the fondant out and there was overlap, would the method still work? Not at all Paigee! You won’t notice the flavor, especially because you wipe the excess off then the rest gets absorbed. Blessings! You need to use a very sharp tool like a new #11 blade exacto knife or a #11 blade scalpel. The sharper the better. If you can switch and use modeling chocolate next time, it’ll be even easier!! I wish you the best!! I cannot thank you enough for this tutorial, along with your Craftsy class and templates! I made an Elephant cake for an adoption shower, inspired by your methods! 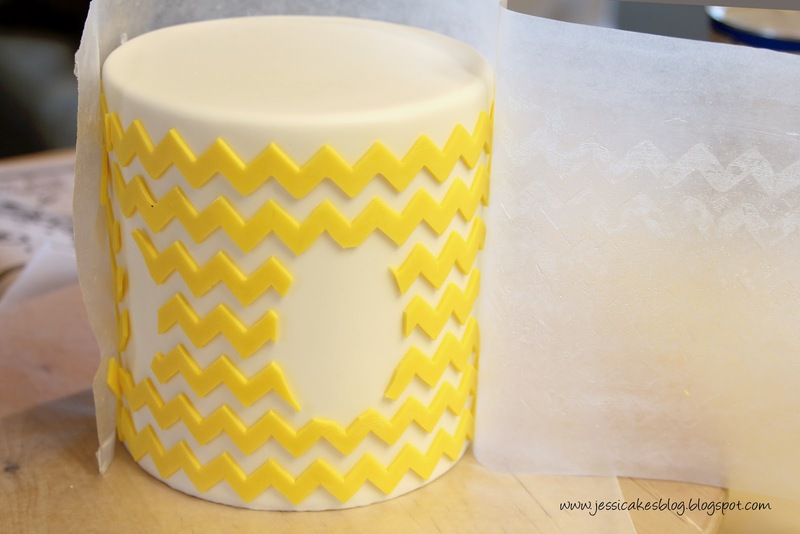 Modeling chocolate and the wax paper transfer method has changed my cake decorating world! Yay!! SO happy you found these tips/tricks helpful!! Blessings! Thank you so very much for sharing this technique for applying the chevron to a cake. I used this technique a day or so ago applying the chevrons to a buttercream iced cake. Instead of using a little water to the back of the chevrons I rubbed them with a little shortening and it worked brilliantly. I would probably still be working on that project had it not been for you sharing this technique. And I love your Craftsy classes. I appreciate so much your willingness to sharing your gifts from God. I believe you have a servant’s heart. Thank you Terry! So glad you’ve enjoyed the classes and all the tips/tricks here! – it’s truly ALL because of Him!